Sadly, many of us have experienced a medical emergency on the road. Here are some helpful tips to help you prepare for the unexpected when on the road. 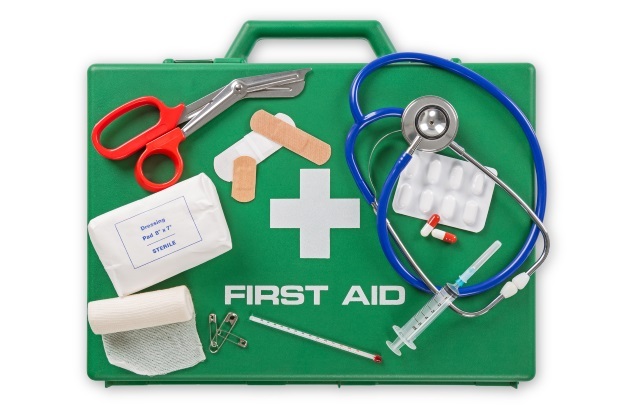 First and foremost, you should always carry a first aid kit with you in your RV. Sometimes we know where we will be staying. Other times, we just hit the road and see where it takes us. If you know where you are going, then planning for a medical emergency is as easy as making your camping reservation. Know the location and do your research. Where is the closest hospital? Most of us have GPS nowadays, so locating the closest hospital is easy. If not, then be sure to ask the staff when you check in at the campground. Many times, the campground has maps of the area. Let me share an experience we had. We were camping at a secluded campground near Smith Lake in Alabama. It didn’t matter what cell carrier you had, cellphones did not work at this campground. Thus, we made it known to the campground manager about our medical conditions. It is always important to let others know in case their assistance is needed. When you’re traveling, you no longer have the friends or family support readily available so it’s important to build what I call a "road family." Really, we had not planned to build a road family, but it just happened along our travels. This is one of the most important steps in preparing for a medical emergency on the road. Along with that it’s important to have a backup means of communication. We learned from our road family, which includes Kris Ann Mills and Charles Smith, that walkie-talkies are a great backup for communication. As a family we all purchased walkie-talkies and programmed them so we could communicate at that specific campground or any future campground we would meet up at. To recap: inform campground staff of medical conditions, rely on your road family and purchase a backup means to communicate. During our trip to Lake Smith we had just arrived at camp and it was Halloween. My daughter Hannah Moody is a 14-year cancer survivor who was diagnosed at the age of three with Wilms tumor. She is now 18. She has long-term effects from this, so it is important to make others aware of her medical condition in case of an emergency. The campground was hosting a huge Halloween party. Normally we never let her out of our sight, but she really wanted to go play on the bounce house obstacle course. At the time, she was about 14. We agreed to set up camp while she took time to be a kid. The next thing you know here comes a fellow camper, driving our injured daughter, on a golf cart. This is where having that road family is important. Being injured, there’s no way she could have gotten back to our campsite. She merely jumped off the obstacle and injured her ankle. Since we had done our research we knew where the local hospital was. After a few weeks on crutches and she was good as new. Another time we were staying at a family campground in Lebanon, Ohio. Lebanon is near the famous amusement park Kings Island. My husband, Durward Ulman, better known as Wild Woody, had suffered another heart attack while we were camping. He had the widow maker in 2008. Take note that when you use your GPS to look for a local hospital you need to do further research because I don’t want what happened to us to happen to you. I am originally from a small town called Roseville, Ohio. Where I live the ER is attached to the main hospital. Apparently, this is not the case in all cities; Lebanon is one of those cities. I drove my husband to the local ER thinking it was attached to a hospital; it was not. They were able to stabilize him and transport him to a local hospital where he recovered. Again, be sure to thoroughly research your surroundings. While everything turned out OK, he could have avoided several different medical bills, including the ambulance ride and could have been stabilized and moved to a hospital room for recovery a lot faster and cheaper. Accumulating unexpected medical bills while on the road can put a damper on the fun. Also, if you have a medical condition, make sure you have your supplies readily available such as your nitro, EpiPen, sugar tablets, etc. If you have a spouse, traveling companion or children, make them aware of your medical needs. If you travel alone this is where it is important to build that road family. It is wise to carry a list of your medications and allergies as well. One final note: do not let a medical condition stop you from traveling. My husband suffers from coronary artery disease, and my daughter suffers long-term effects from cancer, chemo and radiation. I also deal with health issues like hypoglycemia. Traveling can do wonders for your health; it has for ours. Get out there and camp, but be sure to employ the tips from this article. Stay safe, stay strong and happy camping!